by the Rev’d Nancy Rowe. A wonderful way to provide focus on the meaning of Christmas is to set up an Advent wreath on your dining table. A simple wreath with four candles around the outside and one in the middle is perfect. 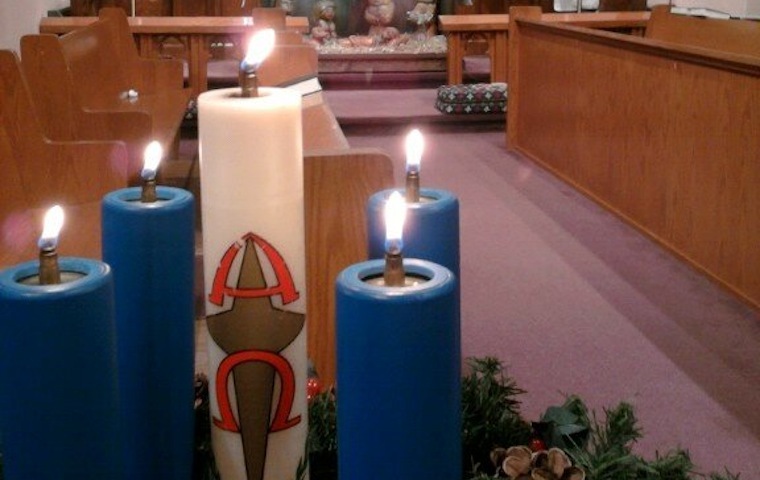 The candles represent the coming of the light of Christ into the world. At the beginning of each meal light one of the candles around the outside of the wreath and say a short prayer. Suggestions for Advent prayers for the next two weeks are included below. For the entire week, the same candle is lit. The next week, that candle is lit plus another one. The third week, three are lit and so on. On Christmas Eve, the candle in the middle is lit. Children love to watch a candle and the Advent wreath marks this time of the year as something special. This is a simple and a special way to recapture the true meaning of Christmas. Prayer: Dear God we ask you to be with us as we prepare for Christmas. Help us to enjoy this time of waiting. Help us to care for others as you care for us. In Jesus’ name we pray. Amen. Prayer: Dear God, journey with us to Bethlehem. Go with us and lead us to your love. Go with us and teach us to love others. We light this candle to remember Mary’s joy in God’s favour and the shepherd’s joy at the good news told to them by the angels. We too rejoice. We rejoice that Jesus is born in Bethlehem. Prayer: Dear God, we rejoice that you give us what we need. Fill our days with joy and help us to share that joy with others. While we have been preparing our hearts for Christmas, God has been leading us, guiding us to the true meaning of Christmas – that He has come into the world in Jesus to be with us, to be close to us. Prayer: Dear God, help us to wait for what You will show us this Advent. Help us to see that You are with us. Guide us by Your holy light to that place where we take Jesus into our hearts.